Foot Pain? Find Out Whether You Could Have a Foot Stress Fracture from Running - Healing Feet - NYC Podiatrist & Foot Doctor. “Stress fracture” is a dreaded phrase in NYC runner circles, but it’s a fact of life for 5-K runners, marathon trainers, triathletes, and recreational weekend warriors alike. Within the foot bones, there are thousands of toothpick-like structures called spicules that support your weight. Repetitive motion through over-training, running form errors, or nutritional deficiencies can cause these “toothpicks” to snap. They’ll eventually be replaced by new ones that make the bone stronger, but you can expect a good six-week break from running activities. Here at The Center for Podiatric Care and Sports Medicine in Manhattan and Westchester, we treat professional and recreational athletes for all different types of sports injuries, foot stress fractures included. How Can I Tell If I Have a Stress Fracture? 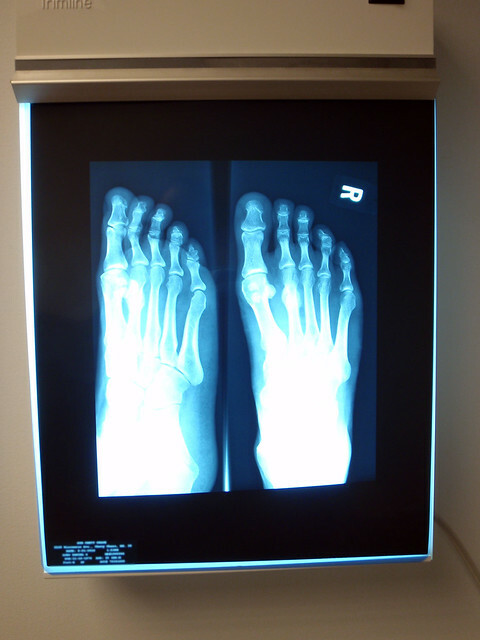 The first natural question a person with foot pain might ask is: “What does a foot stress fracture feel like?” One would think the fracture of a bone would be excruciatingly painful, but more often than not it feels like a dull ache or a tender spot that worsens with activity and feels a bit better with rest.1http://www.beginnertriathlete.com/discussion/forums/thread-view.asp?tid=467047 Symptoms worsen slowly and eventually develop to a more focused pain in a more localized portion of the bone. Most stress fractures affect the metatarsals along the top of the foot, but stress fractures are also possible in the navicular bone further back in the foot. Two sesamoid bones at the ball of the foot are also less frequently injured, which presents with pain on the bottom ball of the foot. Who Is Most at Risk for Developing a Stress Fracture? Interestingly, rates of stress fractures also increase significantly during the winter months. Do I Need to See a Doctor for a Foot Stress Fracture? Stress fractures are frequently misdiagnosed and under-treated. Our NYC podiatrist office is equipped with x-ray, MRI, CT scans, bone scan, and ultrsound machines to detect even the slightest hairline crack in the bone. Often, patients only receive an x-ray, but many traditional x-rays come out looking normal unless the fracture is completely through the bone. How Can I Treat a Stress Fracture at Home? Time is the most important factor for your healing. Sometimes stress fractures can take up to three months to heal. Complete rest is often advisable, but patients with less severe fractures may be able to participate in low-stress activities like swimming, biking, elliptical training, anti-gravity treadmill work, and water jogging to maintain fitness. Ideally, you want to remain pain-free for at least two weeks before you start rehabilitation.2http://www.aapsm.org/stress-fracture.html Icing and elevating the injury as much as possible are also recommended. What Can Be Done to Prevent Stress Fracture or Re-Injury? Running form is a big component in the development of recurrent stress fractures. The Center for Podiatric Care and Sports Medicine has a state-of-the-art gait analysis center that can give you valuable feedback about how you run. If necessary, we can coach you to adjust your form or guide you to a different type of shoe that will resolve issues that may be putting you at risk for future injuries. Alternate running on hard and soft surfaces. Avoid increasing distance too soon (no more than 10% a week). Change your running shoes more often. If you live in the New York City area, contact The Center for Podiatric Care and Sports Medicine for treatment.